Preheat oven to 375 degrees. Place tart shells on a baking tray. Combine lemon juice and apples in a mixing bowl. In a cast iron or heavy skillet, heat the butter until frothy. Add brown sugar and cook until dark in color; about 1-2 minutes. Add apples and toss. Transfer apples to the tart shells. Bake 6-7 minutes. Allow to cool slightly; top with sauce and whipped cream (optional--nutrition info NOT included). 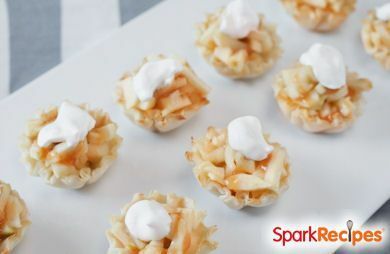 To make your own tart shells:Spray 24 mini muffin cups with nonstick cooking spray. Remove phyllo dough from packaging. Slice into 1 inch strips then cut each strip into 2 inch segments. Using 3 layers at a time, fill the cups, spraying cooking spray between each layer. Repeat process three times. Serving Size: two filled shells with 1 teaspoon caramel sauce. Yes, they are available in the freezer section of the store. Ask at your local supermarket; they should be able to help you find them.